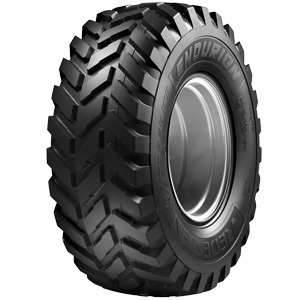 The Vredestein Endurion is a premium agro-industrial tyre, ideal for telehandlers, backhoes, and compact wheel loaders. It provides maximum efficiency on hard surfaces. High rubber content in the tyre construction provides exceptionally long service life. Broad 45-degree angled cleats ensure outstanding self-cleaning ability and traction. An advanced tyre compound and robust carcass design ensures outstanding durability and puncture resistance for prolonged tyre life and optimal return on investment.